who shared his love for Burroughs, the man and his works. 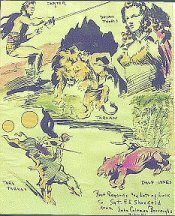 Edgar Rice Burroughs Chain of Friendship (ECOF). is named in honor of the memory of Frank Shonfeld. ERBCOF-List went into operation in August, 1996. Subscriptions to the List are accepted by moderator Jim Thompson. 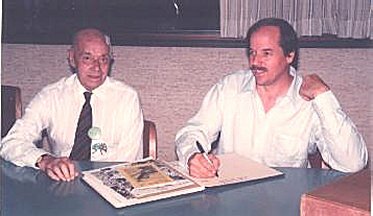 Frank Shonfeld and Danton Burroughs at the Louisville ECOF 1986. Sgt. Frank E. Shonfeld of the British Army on April 21, 1941.
to show his appreciation for Shonfeld's support over the years. ECOF Convention was instigated in his honour. 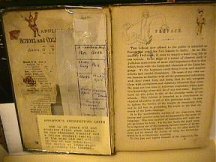 Frank Arthur Edward "Paul" Shonfeld was born in West Croyden, Surrey, south of London in his father's home -- a tailor's shop. 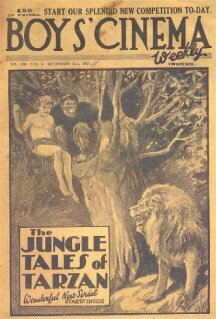 He discovered the writings of ERB in 1921 by way of The Son of Tarzan that was serialized in the weekly "Boy's Cinema" magazine. Finding Burroughs' Tarzana address accompanied the story, he wrote the first of what would be many decades of fan letters. 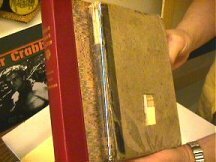 Burroughs answered all the letters but unfortunately the early letters and most of Frank's ERB collection were later lost when his flat was firebombed during a WWII German air raid. Frank, who had joined the British Army in the twenties, served as an antiaircraft gunner during WWII, reaching the rank of sergeant. Knowing that ERB was in Hawaii during the Pearl Harbor attack rushed off a worried cablegram to John Coleman Burroughs in Tarzana, who immediately answered that all was well. Frank's corresondence with ERB continued occasionally even through the war during which they shared stories and observations from their respective theaters of war -- a morale boosting activity for both men. 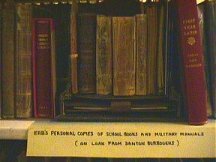 Especially welcome were the numerous first editions that Frank received from Tarzana through the years. After the war Frank left the army to work for the government and it was during these difficult postwar years that Burroughs directed ERB, Inc. secretary Ralph Rothmund to send over boxfulls of foodstuffs, which were very difficult to find in war-torn England. After ERB's death in 1950, Frank carried on correspondence with the office staff and the two Burroughs boys -- John Coleman and Hulbert -- and even Jim Pierce. Later, when John was too ill to write, his son Danton took over the correspondence -- Frank even helped in the naming of Danton's daughters: Dejah Ralston and Llana Jane. Danton carried on his grandfather's tradition of supplying the loyal fan from England meaningful memorabilia and rare editions. 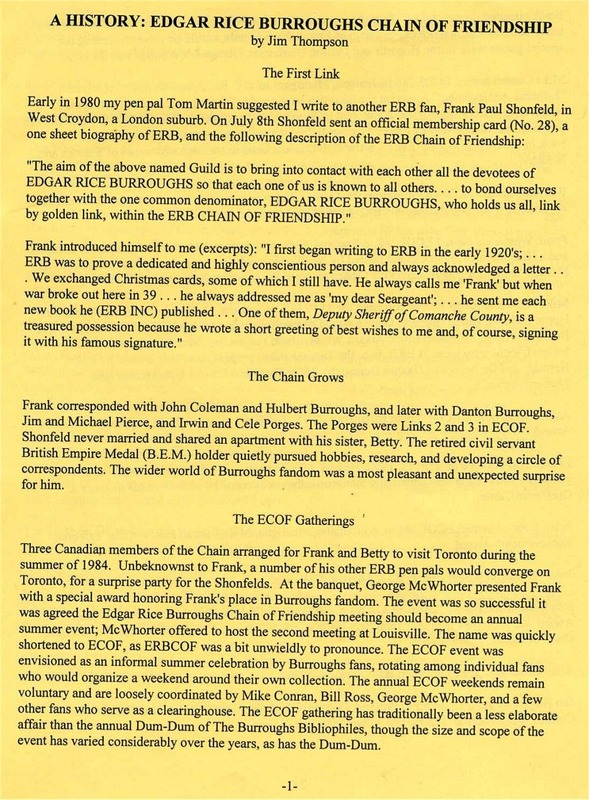 Frank exhibited his dedication to Edgar Rice Burroughs by forming one of the first major International fan clubs devoted to his life and works: ECOF: "ERB Chain Of Friendship." The legacy of this club carries on today in the form of the annual ECOF convention and Jim Thompson's Internet ListServ ERBCOFList. Frank Shonfeld died in 1990. 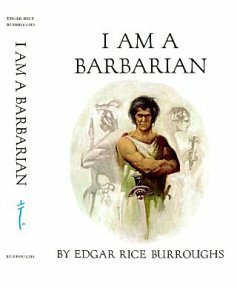 His lifetime devotion to all things Burroughs has earned him the right to be revered as one of the first all-time great fans of Edgar Rice Burroughs. Many thanks indeed for your letter; it was a great treat to hear form you again and to see the old familiar address on the envelope -- it seemed all the intervening years, in a flash, had been condensed to a few weeks. I shall be writing to the publishers in a few days. And here again is evidence of the long arm of coincidence. Since my letter to you, I was browsing through a bookstore a week or so ago and came to a section given over to science-fiction. Suddenly, the name of Edgar Rice Burroughs leapt out and flashed upon my eyes. 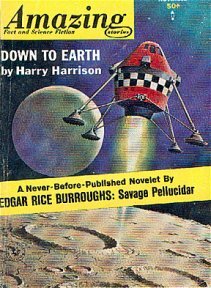 It was on the cover of AMAZING STORIES. 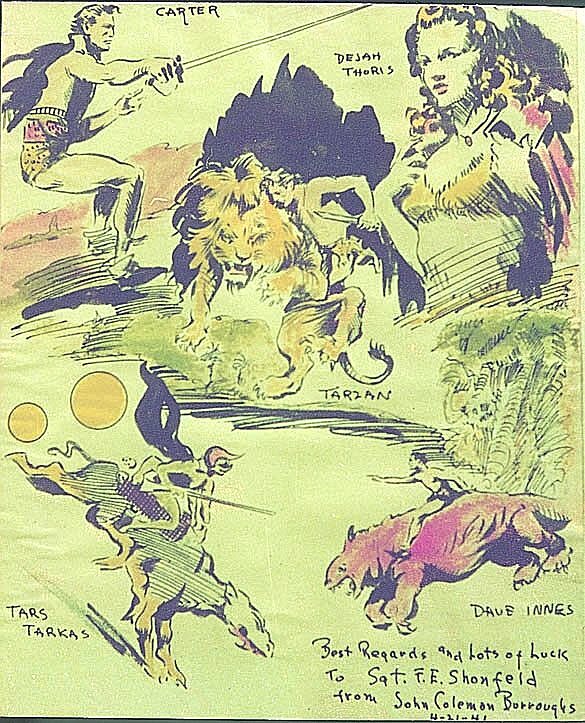 The issue was last November and the banner across the page read: A Never-Before-Published Novelette by Edgar Rice Burroughs -- "SAVAGE PELLUCIDAR!" Of course, I immediately bought the copy -- and read in the editorial more or less what you were to write to me a few days later! And, too, there were the names of your publishers, just as you were to give me. It is amazing how this long arm of coincidence has trailed through my life. Why, I do not know -- perhaps some chap with "ist" or "ologist" at the end of his profession could explain this. Needless to say, I shall be looking forward to hearing from the publishers anent any new work to be published that was written by your father. 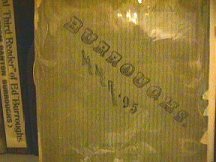 And now about the photograph of the painting of what I call the Burroughs Group. I have written to the Developing and Processing Dept. of Kodak Ltd., but unfortunately they do not contract for "general" work of this kind. I then asked my chemist if he could give me any help in this line and he gave me the name of a friend of his who operates a photographic studio. To this chap I went, explained what I wanted and was told he could do it. He explained the various necessary processes, especially in order to blow the photo up to the same size as your painting, and told me the cost would be something between 7 and 9 pounds. I have, however, been thinking of something else. To avid the complexities of currency exchange, what do you think of the idea of me forwarding the picture to you -- if you are able to get it reproduced through your publishers, who deal in quite a bit of colour-work? I know there is the possible risk of loss or damage to this unique picture through the mail -- but so there is to the reproduction. And yet, I don't know; if I did send you the original, and it ws lost or damaged, I could never forgive myself. No. On second thoughts, don't you think it would be best for me to get the copy done over here? I shall wait till I hear from you before going ahead with the order -- and let me assure you I am only too pleased to arrange the copying from this end. Am glad to say that I am very well. During the last few years I have been going to the Continent for my annual holiday -- to the Costa Brava (Spain), France, Holland, but mostly and more often to Germany. In the early post-war days I met in Croydon a young German p.o.w. whom I was able to help in several ways. We got very friendly and when he was eventually repatriated we carried on a correspondence which still flourishes. I have been to his home on Coburg, Bavaria, a great many times -- and how I love that wonderful country. He has taken me touring through the mountains and big cities -- Nuremburg, Munich, Heidelberg, Ulm, Stuttgart, Bayreuth and lots more... but if ever you want to see breathtaking scenery (and an American like yourself must have seen a great deal) do motor down the Rhine Valley from Cologne to Wurtzburg. It is superb. I have not met any people o warm and friendly as the Bavarians. My friend came over to England two years ago and we had a high old time. But do I love that good old German beer! I have been to many beer-festivals, including the famous Munich Oktoberfest, and memory of it just makes me want to return there soon. By-the-way, the town of Coburg is the birthplace of Prince Albert, Consort of Queen Victoria. Sorry to have rambled on. I shall be looking forward to your letter -- it will be a pleasure to have this copy made for you. 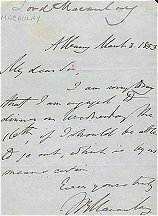 I do hope you have not been thinking I have forgotten you because I have written once or twice to your brother, who has kindly sent me interesting information. I write now to tell you I have written to the two publishers whose addresses you gave me, and have had list of published books of your Father's novels. During the last few weeks I have made several contacts concerning a photographic reproduction of the painting you did for me. I am now happy to tell you that I have this week had the finished picture sent to me and I am quite pleased with it. I do hope you will like it. The only one fault I find with it is the fainter tinting of colours as compared to the original. Your bright red, green and yellow have come out just a little subdued, but still leaves the photo attractive. It is 1 1/2" shorter and 1 1/2" less wide, but I am sure that does not matter. When you see the copy I am sure you will well remember doing the original for me -- which I can now replace in its frame and hang in my room once more, still proud that, while not unique in its singleness, there is only one other of its kind in the world -- and you have it. Perhaps, as it should be. I shall be sending this photo to you by separate post; it is safe in a cardboard container to avoid any folding. I was pleased about its cost, for if I remember rightly, I told you in the first place it would be about 9 pounds. But it came out less, actually, only 5.0.0 pounds. Incidentally , the photographers also sent me the transparency they had made of the painting. I have not yet seen it either in a viewer or projector because both mine are for the larger slides. I do hope you are keeping well, and shall be looking forward to hearing from you again. Just a little souvenir of a very great day in England -- and indeed, in the whole world -- and I do hope this is the first one you get. I will be sending the photo off over this week-end. If you have been to England, have you ever visited Stratford-on-Avon? I've been there many times and find it most interesting and beautifully laid out . . . but it's one of those places where it makes you love the town and countryside but, alas and alack, the Memorial Theatre is no-where half as attractive e as any view-card. But I'm certain you will agree with me that the picture on this air-mail is quite lovely. Thank you so much for the time and effort involved in sending me the photograph of the sketch which I made for you a number of years ago. 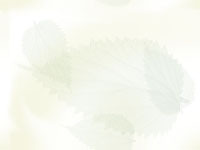 This color enlargement was not really necessary, as I merely wished to have a small photo which might refresh my memory. However, I appreciate the greater size and would be happy to pay you for it, if you will let me know what charge there is. I was happy to have your letter of June 12 and to learn that the photograph had arrived safely and met with your satisfaction. It is true that at the start I had thought of only a small duplication but then realized a much larger reproduction would bring out the detail. I am glad I did this, as the finished article is quite good, though, as I think I said in my letter, the colouring is just a little less brilliant than your own original. Will you please accept it, if not as a mid-summer Christmas gift, then as a token of my great appreciation in having had the original -- and in admiration of the man who made the whole thing possible. I was sorry to hear from your brother Hulbert of your illness; I do hope by now you are very much better. I see form the franking on the envelope of our letter that you are at Malibu; I am sure the air there will do you heaps of good. It is funny what almost forgotten souvenirs are discovered when one starts rummaging in an old trunk that has not been disturbed in the loft for many a long year. I found, only this week, a few of y our Father's letters to me, written from his hotel on Kapiolani Blvd. Oahu. They dealt mainly about the war and the arrival of one of mine, which he had had great pleasure in reading to friends of his who had popped in for dinner one evening. During the war years he always addressed me as "Sergeant", that being my rank. Another letter I found was from a prisoner in Brixton (London) Prison and addressed to me. It was nothing more or less than a grand attempt at confidence trick, in which he asked me to go a 5 pound bail for him -- pleading the excuse in approaching me as being an old friend of your Father. I made a copy of this letter and sent it express to your Father, who, as I knew he would, instantly replied to the Old Bailey in London to hear this man's case come up -- but it didn't. He had skipped prison . . . and so, if I had put up that 50 pound bail, I would have been in real dead trouble. I found out afterwards that he must have read in prison an American issue ot TIME magazine in which your Father had very kindly, to me, had printed some of my letters to him -- letters in which I had lengthily described prevailing war-time conditions in this country. It was a very narrow squeak for me. I am sorry I have not answered your last letter, but I have been very ill for the last nine weeks and am only just beginning to move about the house and tap out a letter a day. I have thought of you once or twice and wondered how you yourself were progressing -- I hope by now you are quite fit and well and bounding along that sandy beach at Malibu. I can't do anything like that because the weather is too damn awful, cold and wet and windy -- but I'll forgo an outing as long as I continue to improve. I think I remember promising to write you about my Bavarian holiday and to send you some pictures; sorry, but that fell through when I began to feel ill -- and now Christmas is on me there will b e a further postponement, but I'll get around to it soon . . . anyhow, I DID begin the article! I've had a letter from Coburg and Peter tells me their district is snowbound and no vehicular traffic can take to the roads! The kids like it -- plenty of ski-ing and no school! I wish you a very Happy Christmas and hope the New Year will be full of good health and good luck. In the first place, many thanks for your Christmas card which took twenty-eight days to reach me! The middle of January though it was, it was very nice to have it. I understand that you have not been too well lately; I do most sincerely hope you are now well back to full health and will remain so for a long time. Having been a sufferer for eighteen months (and I still will be) I can only too fully commiserate with anyone who suffers pain of any kind. Do keep well, won't you. I was one of the lucky ones to obtain a copy of I AM A BARBARIAN. Maybe Hully has told you my impressions of it; I can only say that reading it I found a new admiration for the talents and imaginative creation of your Dad. It meant intensive research for this new field he chose, bolstering it with a brand new Burroughsian style which most certainly soared above almost anything else he had done. I hope it will be the big success it deserves. The only thing in which I was disappointed was to find the illustrations not done by yourself. A great pity. Thank you for your helpful note and the well-wishes, but I was sorry to hear that you are also having your problems. Unlike your case, however, there has been no pain accompanying my illness -- only the emotional frustration and depression engendered by weakness, faulty coordination and nervousness. I am glad you enjoyed the BARBARIAN. My father had always been fascinated by ancient Rome. 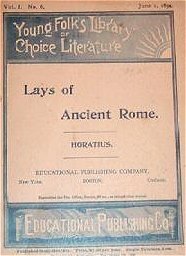 He told me that Macauley's LAYS OF ANCIENT ROMA and especially HORATIUS AT THE BRIDGE probably influenced his writing more than anything he had ever read. I am mailing you an autographed copy of TREASURE OF THE BLACK FALCON. Online eText: "Southey's Colloquies" in Macaulay's Historical Essays. "People live longer because they are better fed, better lodged, better clothed, and better attended in sickness, and…these improvements are, owing to that increase of national wealth which the manufacturing system has produced…We see in almost every part of the annals of mankind how the industry of individuals, struggling up against wars, taxes, famines, conflagrations, mischievous prohibitions, and more mischievous protections, creates faster than any governments can squander, and repairs whatever invaders can destroy. We see the wealth of nations increasing, and all the arts of life approaching nearer and nearer to perfection, in spite of the grossest corruption and the wildest profusion on the part of rulers." I am chancing this letter against the probability of you accompanying Hully to London -- as I hope you will be doing, thereby giving me the chance to meet you, but I am hoping you will also get this letter as soon as possible. You wrote me on March 25 saying that you were mailing me a copy of THE TREASURE OF THE BLACK FALCON. It is now eight weeks later and I am sorry to say no book has arrived. I well remember that I AM A BARBARIAN took a long time to come over, so there is still the hope it will turn up -- probably as soon as I have posted this letter. Nevertheless, I thought I would let you know -- if you are still in Tarzana and not en route to the U.K. I do hope you are continuing in good health; I have a hospital check next Tuesday for which I am thankful as pain from my back is travelling down my legs, so I am hoping for a not too worrying diagnosis. Your book has arrived to-day and from your note inside I am glad the parcel had not been lost in transit. 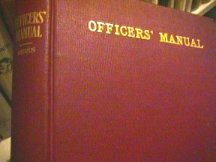 Many thanks indeed for your kindness in sending it to me -- I look forward to the coming week-end when I shall settle down quietly and read it - or, as my Dad always taught us boys and girls, "to read, mark, learn and inwardly digest." I note the dedication to Hully. I rather fancy this is an oblique reference which has nothing to do with the Fortune of the Black Falcon, but rather to the discovery of the unpublished manuscripts of your Dad, discovered in the safe. If it is not then I should like to stick to my own theory -- especially as it savours of the kind of humour reminiscent of ERB himself. A week tonight and I shall be waiting for Hully to phone me. Since he left Tarzana I have been so impatient for the weeks to pass, to meet him. It seems incredible that since that first letter of mine to your Dad, till now, on the eve of meeting one of his sons, that over forty-five years have come and gone. An hour in Hully's company -- even a couple of days -- will not give us time to cover all we have to talk about. I must confess when I did not hear from you after my last letter that you were with your brother; now that would have been SOME meeting, eh! After all, it was you I cabled at the time of Pearl Harbour, and again when your Dad passed away. Nevertheless, I thoroughly enjoy your infrequent letters, and hope to for a long time to come. When I have read your book I shall write to you about my reactions; in the meantime, John, I do hope you are now much better and will keep on getting better. Many thanks again for your kindness and thoughtfullness in send me BLACK FALCON -- I appreciate it no end. On July 26 I leave for 2 weeks holiday touring in Scotland; if I can't send you a haggis then it will be a few view-cards! I have a recollection that some time ago I promised to send you some views fro Scotland where I had spent last summer's holiday. WEll, better late never, here they are and I do hope you will enjoy looking at the scenes of some of the fascinating places I visited while up North. It was my first visit to Scotland and I certainly want to go there again; the word "bonnie" best describes the beauty, the desolation, the freshness, the grandeur of this wild Highland land, and the people, so much like the people from Devon, Cornwall and Somerset, are so friendly and hospitable. I most certainly have to go to Scotland again; after all, as they sing in their haunting melody, "Will ye no come back again?" At the hotel I stayed in at Blairgowrie I was served excellent food but the nearest I ever tog to anything in the way of a Scottish concoction was porridge for breakfast. Not even the whisper of a haggis -- had it been served I would most certainly have eaten it; after all, I've eaten octopus in Spain and once, only once, gingerly tried a frog in Paris -- but it was only one small bite! Albeit, I detest oyster, whelks and cockles, the two latter proving I am not a 100% Englishman and definitely not a Londoner. I do hope you are keeping well and at least active to get cracking on another of your thrilling books. Why not do a Tarzan book? Why leave the continuance of this grand character's adventures to other s for transference too the screen -- where they are good but not as interesting as a well-written Tarzan book by the son of the author, brought up on his books from childhood. I showed Hully your original painting if ERB's famous characters; he was most intrigued with it and told me never to part with it. No need to tell me that -- I won't! It is haning in front of me now as I write and is admired by all who come up into my little den. Cheers for now, John, best o' luck, good writing and good health.